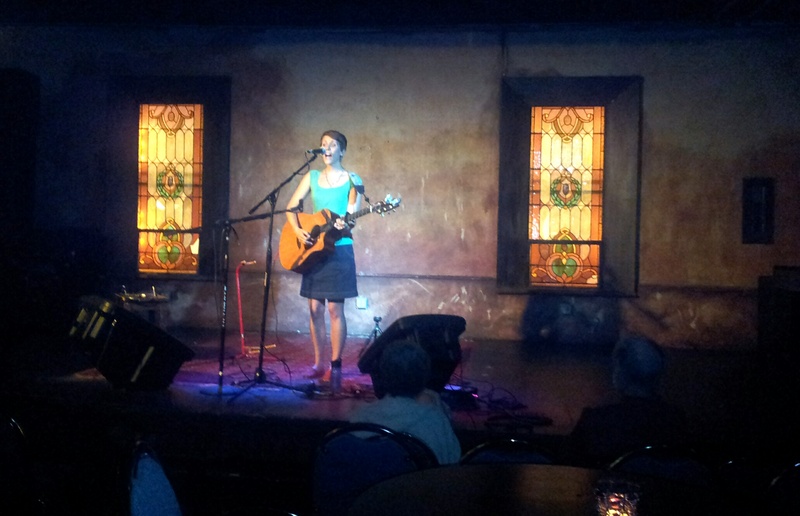 *performing last weekend at Trinity House Theatre in Livonia, MI. Have you ever hidden away some piece of your past only to find it years later when you least expect it? And the memories locked away that were tied to that piece are unleashed in your consciousness? This weekend I performed at Trinity House Theatre in a green shirt I had buried at the bottom of my dresser drawer. I wore this shirt often, years ago, at a time in my life when I was clothed in insecurity and fear. I was plagued with unhealthy relationships and the good friendships I had, I pushed away. Something strange happened as I began to play. The same fear that overtook me in that long-ago season started to well up again. Does that make sense? I remember wearing this shirt for my first sound check at the Contemporary Music Center. 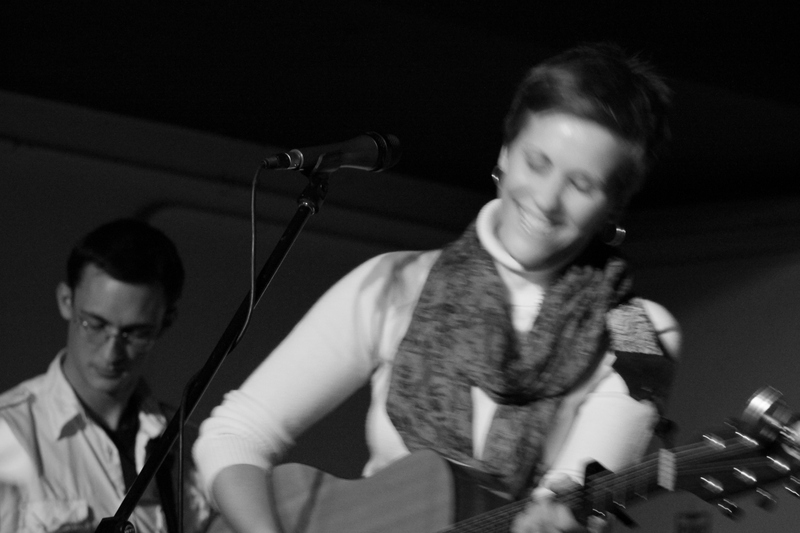 It was a nerve-wracking debut in a room filled with strangers with whom I’d share a tiny corner of Martha’s Vineyard for four months studying the intricacies of the music business, songwriting, and artistry. No pressure… or anything. 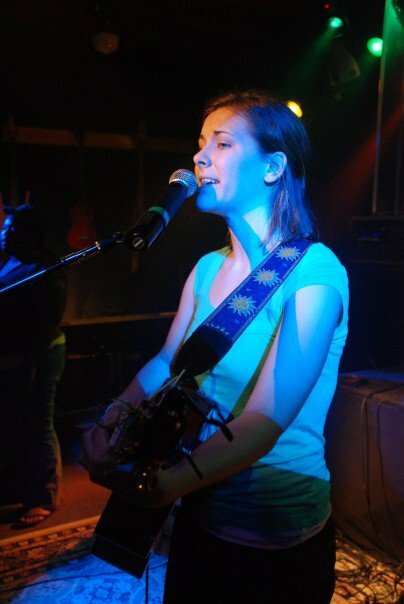 As I timidly began my set at Trinity House, I pictured myself with the same shoulder-length hair cut and extra 15-20 pounds, playing my old, unpolished songs. Since then I know I’ve grown, I’ve matured, I’ve let go. But the rest of the night I had to remind myself that my hair was not that long, that things have changed, and I’m not that same person. All because of a green shirt. 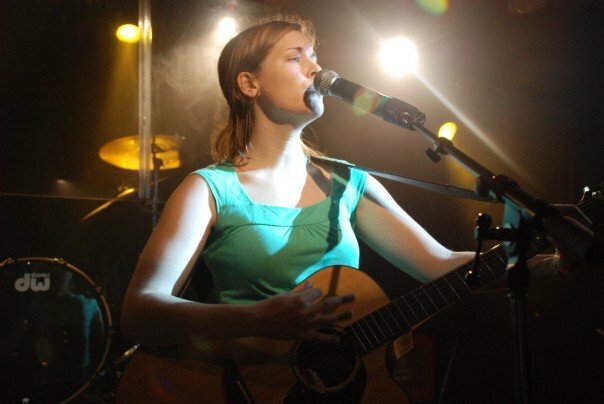 *pictures from my first sound check on Martha’s Vineyard in 2007 in the aforementioned green shirt. Sometimes I’m overcome by the fear that the person I was in that time hasn’t really changed. That I’m still the same confused scared little girl I was, and I’ll never not be her. 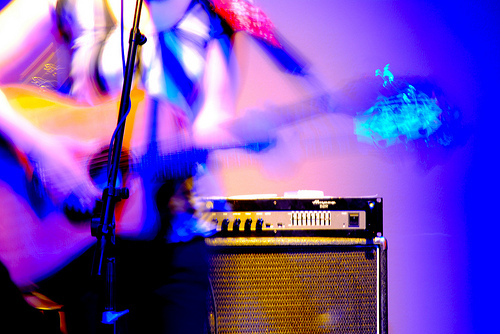 As an Indie Girl, it’s easy to feel like you’re alone. Like even your closest friends and family don’t understand you. But listen, I didn’t get out of that mess alone. I had a community of people surrounding me and wrapping me in the truth. Some of those people I found on that Island at the Contemporary Music Center. And some of them had been there all along, praying for me to see the truth: that I was LOVED. Loved enough that they would not let me destroy myself in messed-up relationships. Loved enough that they would frustrate the hell out of me if it meant I’d turn around and open my eyes. More loved than I knew then. More loved than I know now. More loved than I will ever know. YOU ARE LOVED. YOU ARE PRECIOUS. AND YOU ARE NOT ALONE. Even if you have crap friends, and your family abuses their role in your life: YOU ARE LOVED. Even if you push the ones you love away, and cling to the ones that hurt you and you don’t know why: YOU ARE LOVED. Even if you hate yourself: YOU ARE LOVED. How can I say this? How can I be sure? Beloved, you have been loved from before you were born by the One who thought you up. As an artist, you’ll appreciate this. God… thought of you, and you came to be. The way you think of songs, or stories, or drawings, or whatever. Ephesians 2:10 says that you are His “workmanship”. The Hebrew word (the original language of the New Testament) is poiema, meaning art or masterpiece. You weren’t just another created thing that God forgot about. You ARE his masterpiece! God… thinks of you… still. Even after everything! He not only thought you up, but when He was done thinking you up, He said, “That’s GOOD!” Who else has tingles? Yeah, old clothes need to be thrown away, or given to Salvation Army. After all, we are new creations! Okay, maybe not your whole wardrobe, start where you can, and if you think you need to. It’s okay to get rid of things that may tie you to, or remind you of, those dark places. So I’ve decided one thing that will help is to go through my house and get rid of old relics, lost idols of the past that I’ve held onto for bad reasons. Don’t worry, only things from this particular season of fear. I kept them to remind myself, in my pride, that I had conquered. But it wasn’t me that conquered. Phillipians 4:13. Given the right circumstances, I might fall into those same traps. Why? What drove me then was fear. True Love drives out fear completely 1 John 4:18, but if I were to turn away from this love today, I would find the same stumbling blocks. I need to cling to this love with everything I’ve got. What does this have to do with being an Indie Girl? What does this have to do with art or songwriting or music? We create because we are made in the image of The Creator. And if we don’t embrace that, our art will suffer. This is why I was so afraid while playing at my show last weekend. I had a flash flood of memories that made me feel like I wasn’t good enough, pretty enough… etc. The old voices that used to run my life for a while. The ones that told me to stop writing cuz I sucked anyway. The ones that made me compare my body shape to every other girl I knew. The ones that made me so hopelessly desperate for love that I’d do stuff I wasn’t proud of. Those voices crippled my art because they crippled my life. That’s no way to be. If this is where you’re at, your creator longs for you to stand in the freedom and love that He created you for. That starts with telling God that you want the love He has for you, and with telling those voices to shut up. If you have questions about this you can email me at risetide@gmail.com. I’d like to share with you a recent discovery, or a re-discovery, rather. A key to success, I think. Because everytime I’ve put this tip into action things work out better. So here it is, whether you are a songwriter, singer, band member, fan, manager, music lover… whatever your ambitions and dreams, think of this when things look bleak. When you’re stressed, tired, nervous, afraid. When you’re up on that stage in front of a full, loud, brewery and you’ve played through your set list faster than you thought and you need another half hour’s worth of music. When you accept a challenge (from life, God, or anyone in between) and you’re completely unsure if you’ll rise or fall. It’s simple. You may think it’s too simple. Over done. The past few weeks I’ve felt this peace come over me in times of great stress. When I’m tempted to freak out or scrunch my shoulders up and hold my breath like I’m bottling up all the tension inside my person so to control it somehow. A simple thought has conquered this week. This is a mantra that my husband repeats to me when we pray for enough money to pay our bills. It’s the phrase he says when he pulls me in tight to help me remember that I’m not in control and that that’s okay. Unless of coarse it’s not alright. But even then, I can choose to be alright with that. I can only embrace this when I understand that “alright” does not mean perfect. It does not mean without flaw or misstep, but it does mean I will choose to stay positive and calm; joyful in the midst of hardship, conflict, and stress. Don’t worry about how. Don’t worry about when. Don’t worry. Just breathe, take a second to collect your thoughts. Pray. It’s going to be alright. This statement was made in a recent Indie On The Move blog article entitled “Are We There Yet?” This was in reference to sticking together as a band. Why must courage be represented by male genitalia… or genitalia in general? It would be just as ridiculous if we replaced balls with ovaries in this sentence. “It takes ovaries to keep caring.” In some ways this is more true, since women are known more for their ability to nurture which is precisely what is needed when conflict erupts in a band of either gender. But, setting aside the objectification of men and the exclusion of women, when I choose to look at the intention behind this statement, I would agree. The constructs of my band changes from year to year. And honestly, sometimes, it seems like I’m the only one who cares. Maybe that’s because my name is in the band title. Kelsey Rottiers & the Rising Tide has been a functioning concept with rotating players for 4 years now. Every year it changes. I’ve considered taking my name out of the title and using more of a band-y name, but then I dread the work of changing our branding, website, and social media pages… and what if we change the name, but the problem doesn’t go away? This weekend I purchased a long awaited documentary which was the brain-child of my former teacher, Will Gray, called, Broke. If you are interested in learning about the climate of the music industry today, you NEED to purchase this documentary. It is so well done and really educational for us Indies who are looking for guidance. Should we try to “get signed” or “get discovered”? Should we stay independent for our whole careers? This documentary can’t answer those questions for you, but it can shed some light on the realities of both options. The biggest take-away from the documentary was to build a team. Seth Godin (interviewed in Broke) calls it a Tribe. Build a network of reliable people you trust with your art and your career. Because you may start out on this journey alone, but sooner or later you’re going to need some help, and that’s okay. My career goals for a while have been to build a community of support around my music that can help keep it alive and make it bigger than me. This includes band members, fans, managers, booking agents, social media gurus, places to stay while on tour, co-writers, recording engineers… all of it. How do you build this? One relationship at a time. One show at a time. One record at a time. One song at a time. It may not take balls to keep caring about your art, but it does take courage. So, ladies, let’s do this!